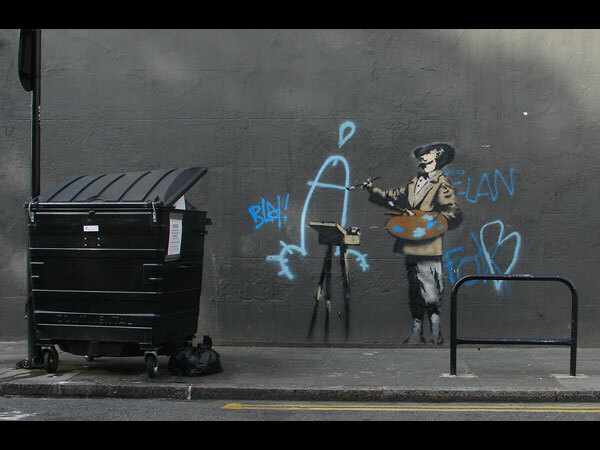 lies like truth: Is Street Art Over? Ben Davis' incisive slide-illustrated meditation on the state of street art in Slate poses fascinating questions about the tipping point between art and commerce. "Part of the lore of street art is that it is about the individual taking on the system," writes Davis. "Yet today, rather than feeling anti-commercial, the scene represents a kind of parallel-universe art world, with its own thriving cast of stars and set of commercial values. Street art's anti-establishment posture often shades seamlessly over into scrappy entrepreneurship...These days, it can be hard to tell where marketing ends and art begins." Documentation has perhaps been the strongest force in helping to disseminate and turn into "product" what used to be a renegade art form. Without being endlessly photographed and disseminated on the web, a work like Banksy's 2005 project on Israel's West Bank separation wall would not pack anything like the same political punch that it does. And yet at the same time, the documentation is killing the lithe, underground nature of street art by making it commercial and turning it into a product of the art establishment. I mulled over these ideas in a recent article about the Bay Area street art scene for the New York Times, but I think Davis' illustrated essay is much more thoughtful and penetrating than my own attempt to unpack some of the tensions and forces at play in this realm. I don't think street art is over, but it's perhaps entering the early stages of a slow demise.